Melt their heart with sun-crushed blooms blossoming with an array of color and light your recipient wont soon forget. 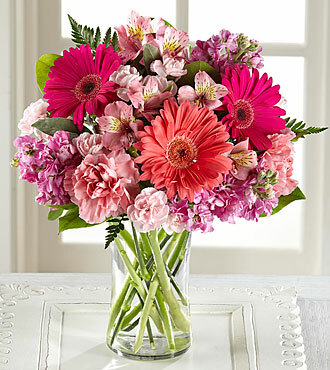 Coral and hot pink gerbera daisies captivate the eye surrounded by pink Peruvian Lilies, pink and hot pink gilly flower, pale pink carnations and mini carnations, and lush greens situated beautifully in a modern clear glass vase. A simply wonderful way to send your warmest wishes in honor of their birthday, as a thank you or get well gift, or to shower them with your love and affection! DELUXE bouquet includes 17 stems.